technology has turned the marketing world on its head. In order for brands to succeed in today's socially connected world, they must think like publishers and act like media networks. 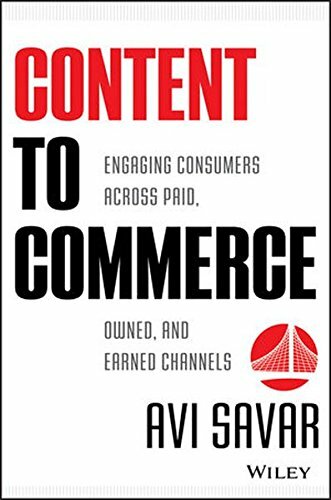 Content to Commerce shows how utilizing publishing- and entertainment-based principles can help brands and marketers use social media effectively—ultimately reaching today's hyper-connected and highly fragmented audiences. From big picture strategy to the tactics and tools require to execute, this book offers a clear approach to social media marketing for both big and small brands alike. Shows how to turn shallow, wide, and short-term projects into deep, narrow, and long-term engagements Explains how to prioritize with a clear escalation path in order to drive big, significant, and measurable value Author Avi Savar is a frequent media commentator on social media, branded content and marketing and was recently named the Jury President of the Cannes Lions International Festival of Creativity’s new Branded Content & Entertainment category Content to Commerce will show you how to conquer the media world's medium and control your own brand's destiny.